Termites are a group of Eusocial Insects that live in colonies. Drywood termites form colonies of up to 2,500 members. Drywood termite colonies don’t have workers. Younger termites, called “false workers”, do all the work for the colony. Therefore, it is necessary to take the proper steps to protect your homes from termites and get rid of them. Diet: Dampwood termites like to feed on very moist wood. 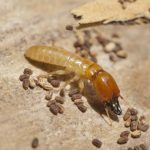 Habitat: Because they need lots of moisture, dampwood termites usually live in damp, dying wood or in houses with leaking plumbing that keeps the wood wet. Impact: Dampwood termites do not carry disease and don’t usually bother buildings because there is not enough water in the wood. Make sure all water drains away from your house.